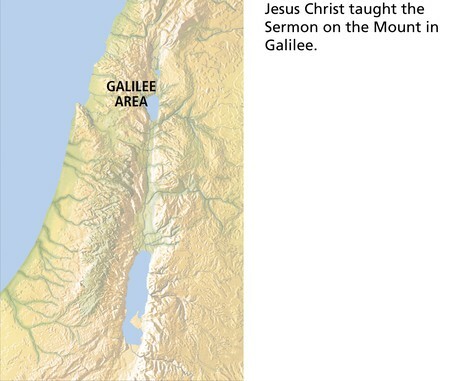 President Thomas S. Monson (1927–2018) spoke of the Sermon on the Mount and the Galilean hillside where it took place: “Here it was that the greatest person who ever lived delivered the greatest sermon ever given—the Sermon on the Mount” (“The Way Home,” Ensign, May 1975, 15). As the Savior began His Galilean ministry, He declared that “the kingdom of heaven is at hand” (Matthew 4:17), and then in the Sermon on the Mount (see Matthew 5–7) taught doctrines and principles of righteousness that govern the lives of those who belong to His kingdom and lead to happiness and eventual perfection. Jesus Christ began His Sermon on the Mount by teaching the Beatitudes. He declared that the law of Moses was fulfilled and taught the righteous way of life that leads to becoming perfect like Heavenly Father. The Savior continued the Sermon on the Mount, teaching how to pray, fast, and serve others. He taught His disciples to place love of God over the cares of the world. Jesus Christ concluded the Sermon on the Mount, teaching that the way to eternal life is narrow and that those who enter into the kingdom of heaven are those who do the will of Father in Heaven. Note to teacher: Because there are so many important teachings in this scripture block, you will have to be selective about what you teach. Consider the needs of your students and seek the guidance of the Spirit as you determine what to teach. If the length of your course permits, you might consider taking two class sessions to teach this material. “First of all, we are teaching people, not subject matter per se; and second, every lesson outline that I have ever seen will inevitably have more in it than we can possibly cover in the allotted time. “An unrushed atmosphere is absolutely essential if you are to have the Spirit of the Lord present in your class” (“Teaching and Learning in the Church,” Ensign or Liahona, June 2007, 91). To help students understand the context of the Sermon on the Mount, have a student read Matthew 4:25 and Matthew 5:1. Explain that Matthew 5 is a continuation of Matthew 4. “The Latin beatus is the basis of the English ‘beatitude,’ meaning ‘to be fortunate,’ ‘to be happy,’ or ‘to be blessed’” (Matthew 5:3, footnote a). “Name given to certain declarations of blessedness in the Sermon on the Mount (Matt. 5:3–11; Luke 6:20–22). They describe certain elements that go to form the refined and spiritual character, all of which will be present whenever that character exists in its perfection. Rather than being isolated statements, the Beatitudes are interrelated and progressive in their arrangement” (Bible Dictionary, “Beatitudes”). What important phrase does the Book of Mormon add to this Beatitude? Why do you think the phrase “who come unto me” is an important addition? As you look at this list, what do you see that shows how the Beatitudes are interrelated and reflect a progression of coming unto Christ and becoming more like Him? From your experience, how has living one of the Beatitudes increased your level of happiness? Encourage students to consider which of the Beatitudes they most need to improve in and commit to work on this attribute during the coming week or month. As you teach the remainder of Matthew 5–7, you might encourage students to consider how the Beatitudes are connected to the rest of what the Savior taught in the Sermon on the Mount. Ask students to consider this principle: Applying the principles taught in the Beatitudes helps us to come unto Christ and to obtain greater happiness. Ask them to share ways in which they have seen the truth of this principle. Help establish the context of this scripture block by asking students to read Matthew 5:17, 48. Jesus taught that He came to fulfill the law, and He also taught that the ultimate purpose of His teachings was to help us become like Father in Heaven. The law or custom that the people had heard. The principle Jesus Christ taught. How living that principle helps us become more like Heavenly Father. A brief experience illustrating how the principle has helped you (if desired). Note to teacher: It might be helpful to write these four items on the board so the students can refer back to them. Divide your class into small groups or pairs. Assign each group to study one of the four remaining blocks of scripture listed on the board. After students have had time to read and consult with each other, have groups share their responses with the class. Have students look in Matthew 5:48 for what might be the most difficult commandment that the Savior ever gave. What commandment did Jesus give in this verse? How might someone feel when first reading this verse? Have students read 1 Nephi 3:7 and Philippians 4:13. What do these scriptures teach about the Savior’s command to be perfect? Ask a student to read the statement by President Russell M. Nelson in the student manual commentary for Matthew 5:48. How does this statement encourage you in your quest for eventual perfection? Explain to students that in Matthew 5 we learn this principle: By following the teachings of Jesus Christ, we can become like our Father in Heaven. Testify that with the help of the Lord, we can fulfill all of God’s commandments. Although we will not achieve perfection in this life, we can strive for perfection and actually become perfect in many commandments while in mortality. Through the Atonement of Jesus Christ, becoming perfect like our Father in Heaven is possible in the eternities (see Moroni 10:32–33; D&C 67:13; 76:69). Explain that as recorded in Matthew 6, the Savior taught important principles about how to worship the Father, including by praying, by fasting, and by serving others. Have students make a brief list on the board of various reasons why people might pray, fast, or serve others. Ask one-third of your class to read Matthew 6:1–4, another third to read verses 5–6, and another third to read verses 16–18. Have each student look for what counsel the Savior gave concerning our worship. One of the more effective scripture teaching skills is to send students into a block of scripture looking for specific things. This scripture study skill encourages students to develop a spirit of inquiry that will increase their comprehension of the scriptures. Instead of the group activity just described, consider showing the video “Sermon on the Mount: The Lord’s Prayer” (2:18) from The Life of Jesus Christ Bible Videos, available at LDS.org. This video covers Matthew 6:1–13. Before you show the video, encourage students to follow along in their scriptures, beginning at Matthew 6:1, and to look for what Jesus taught about sincere worship. At the conclusion of the video, continue with the teaching suggestions as indicated. How can a person determine if he or she worships God and serves others “for the love of God and the love of his children”? What should motivate our worship—including our praying, fasting, service, and payment of tithing and fast offerings? In what way do these verses and the commentary help you as you evaluate the way you worship God? How did Elder Joseph B. Wirthlin define vain repetitions? What suggestions did Elder Wirthlin give for helping us remove vain repetitions from our prayers? Prayer is a time to show reverence and respect to our Father in Heaven (Matthew 6:9). We pray to seek the Lord’s will (Matthew 6:10). Part of prayer is asking for things we need (Matthew 6:11; 7:7). In prayer we should seek forgiveness of sins (Matthew 6:12). When we pray, we may ask for help in overcoming temptation (Matthew 6:13). What have you done to show reverence and respect to Heavenly Father in your prayers? How has showing reverence and respect toward Heavenly Father in your prayers affected your prayers? What do the words ask, seek, and knock teach you about effective prayer? What can we do to better align our desires with the Lord’s will? What have you done to better align your life with the Lord’s will? According to the Savior’s teachings, what types of things should we not be overly anxious about? What are some examples of laying up treasures in heaven? Read or ask a student to read the quotation by President Ezra Taft Benson in the student manual commentary for Matthew 6:33. How does putting God first in our lives cause other priorities to fall into their proper place? Elder Joseph B. Wirthlin (1917–2008) of the Quorum of the Twelve Apostles taught: “The more [students] discuss what the gospel actually means in their lives, the more will be their inspiration, growth, and joy as they try to solve their personal concerns and challenges” (“Teaching by the Spirit,” Ensign, Jan. 1989, 15). One way to accomplish this is to ask students to share how they have successfully applied a gospel truth in their lives. Students will do better with this type of question if you give them a moment to think about their answers before calling on them. Invite students to share experiences when they have felt less anxiety or worry because they chose to make the kingdom of God a higher priority in their lives. You might ask them to tell about challenges they faced in making this choice, what other activities became less important, and how the Lord blessed them when they made Him and His kingdom their first priority. Note to teacher: Consider summarizing Matthew 7:13–20 with the students. This could be done by quickly highlighting several key doctrines, such as the following: narrow is the way that leads to eternal life, beware of false prophets, and by their fruits you shall know them. To enter the kingdom of heaven, it is not enough to . Assign half of your class to read Matthew 7:21–23 and the other half to read verses 24–27. Have students verbally fill in the blanks in the sentence on the board, based on the scriptures they read. As students share their reports, this principle should be emphasized: Those who enter the kingdom of heaven are those who do the will of the Father. As you conclude the lesson, encourage students to take a minute or two and write how they might better live one or more teachings discussed in class today. To help students apply these teachings, ask if any class members might be willing to share what they have written. According to the Savior’s teachings, why are we to be a light to the world? How does setting a righteous example for others glorify our Father in Heaven? Emphasize that the Savior’s words about being “the salt of the earth” and “the light of the world” teach this important principle: We glorify our Father in Heaven when we set a righteous example for others. Consider telling students that the Joseph Smith Translation adds the phrases “I give unto you to be the salt of the earth” and “I give unto you to be the light of the world” (Joseph Smith Translation, Matthew 5:15–16; italics added). Salt was a preservative and a symbol of the gospel covenant. Light helps others to see. By using these symbols, the Savior was inviting all of us to become missionaries by living the gospel, sharing its light, and inviting others to enter into covenants with the Lord. How do the Savior’s teachings in these passages illustrate the principle taught in Matthew 7:2? How do the teachings in Luke 6:38; Alma 41:14–15; and Doctrine and Covenants 1:10 further help you understand this principle? How can we avoid improperly judging or criticizing others? How do the Savior’s teachings in Matthew 7:2, 12 relate to the Beatitude in Matthew 5:7? Through discussion of these questions, the following principle should be highlighted: The way we treat others affects the blessings and rewards we receive from God. Point out that Matthew drew numerous parallels between Moses and Jesus Christ, perhaps hoping Jewish readers of his Gospel would accept this doctrine: Jesus Christ was the Messiah foreshadowed by Moses (see Deuteronomy 18:15). Share some of the following points with your students, or put some of the information about Moses on the board and have students find the corresponding information about Jesus Christ from the Gospel of Matthew. Help students understand that many aspects of Moses’s life serve as a type, or foreshadowing, of the life and ministry of Jesus Christ. Pharaoh sought to kill Moses as an infant (see Exodus 1:22). Herod sought to kill Jesus Christ (see Matthew 2:13–16). Moses came out of Egypt (see Exodus 2). Jesus Christ came out of Egypt (see Matthew 2:15). Moses was tempted by Satan (see Moses 1:12–22). The Savior was tempted by Satan in the wilderness (see Matthew 4:1–11). The first five books of the Old Testament are the books of Moses. The Savior delivered five major sermons in the Gospel of Matthew (see Matthew 5–7; 10; 13; 18; 24–25). Moses gave the law to the Israelites (see Exodus 20). The Savior fulfilled the law (see Matthew 5:17–48). Moses received the law on a mountain (see Exodus 19–20). Jesus Christ taught from a mountain (see Matthew 5:1). Moses controlled the waters of the Red Sea (see Exodus 14). Jesus Christ commanded the winds and the sea (see Matthew 8:24–27; 14:25). Moses was meek above all men (see Numbers 12:3). Jesus Christ is “meek and lowly in heart” (see Matthew 11:29). Moses was transfigured on Mount Sinai (see Exodus 34:29). Jesus Christ was transfigured on a mountain (see Matthew 17:1–13). Moses raised the brass serpent in the wilderness (see Numbers 21:6–9). The Savior was raised on the cross (see Matthew 27:35; John 3:14–15). Moses was sent to deliver Israel (see Exodus 3:8). The Savior was sent to deliver all mankind (see Matthew 1:21; 28:18–20).